Gooey Oreo Krispie Treats dessert recipe, or “Cookies and Cream Bars”, is your favorite childhood treat loaded with chunks of Oreo and only 3 ingredients! Perfect for the holidays! I am so excited for Christmas that I just can’t stop baking! This is my absolute favorite time of the year and I’ve had my Christmas tree up since October 28th. It was a moment of weakness and the first really cold day of the season that made me do it. 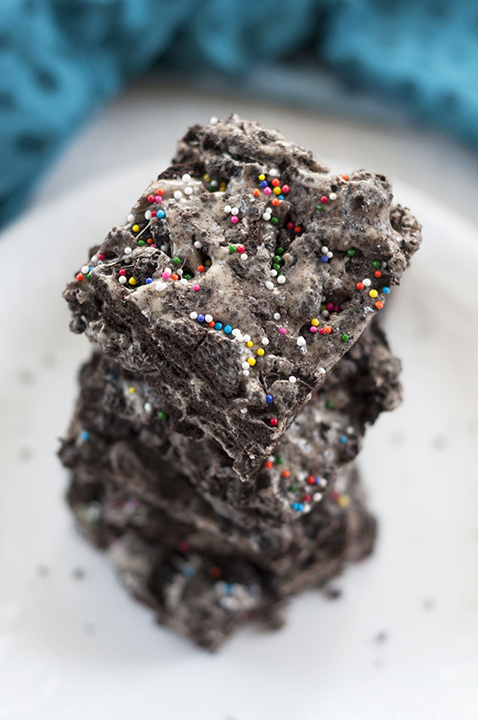 Now you might be thinking to yourself, what do Gooey Oreo Krispie Treats have to do with Christmas? 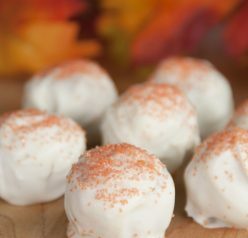 Well, let me tell you why these are actually the perfect holiday dessert. I think about how many Holiday Oreo Truffles I’ve eaten over the years at Christmas. I always always ALWAYS make those for my holiday dessert trays. 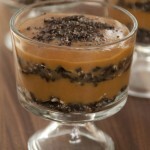 Oreos are perfect for a holiday dessert…. or any time of the year, really. 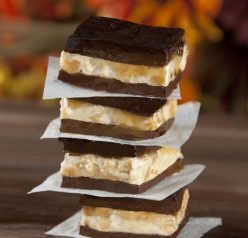 This recipe is absolutely amazing and a nice twist of everyone’s favorite Rice Krispies Treats. The Oreos give this classic recipe the new perfect spin. I really don’t think I can ever go back to regular ol’ rice krispie treats anymore! Load them up with some red and green sprinkles and you have yourself a festive dessert in 15 minutes flat! If you’re looking for something even more fun than these Gooey Oreo Krispie Treats (as if that were possible), you have to check out my Oreo Stuffed Chocolate Chip Cookies. Oreo cookies stuffed inside chocolate chip cookies? Yes, please! Here is my “how to” video with step-by-step instructions on how to make these Gooey Oreo Krispie Treats! 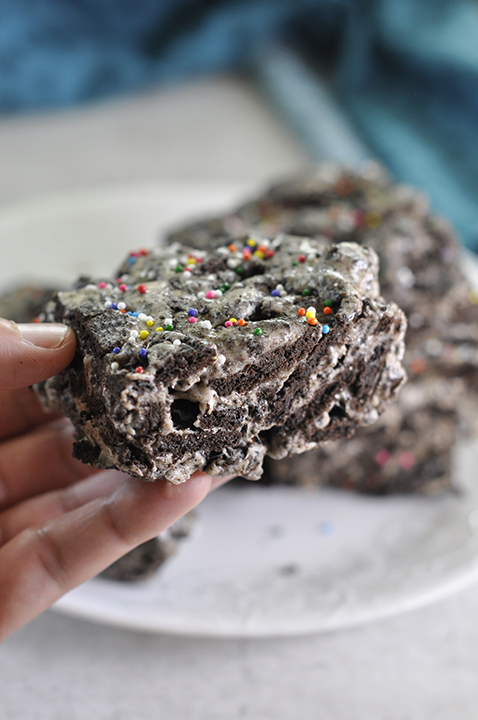 Gooey Oreo Krispie Treats dessert recipe, or "Cookies and Cream Bars", is your favorite childhood treat loaded with chunks of Oreo and only 3 ingredients! Place your Oreos in a Ziploc bag, seal it, and crush them and with a rolling pin. You can also pulse them in a food processor but leave them chunky - you don't want crumbs. Place them in a large bowl and set aside. Heat a pot on the stove over medium-low heat, melt your butter being careful not to let it burn. Add marshmallows and stir often until melted. Immediately, pour the melted marshmallow mixture over your crushed Oreos and stir to combine. Grease a 9x13-inch baking dish and press the mixture evenly into the pan. Tip: These Oreo bars will keep well in an airtight container for up to three days. Love all the holiday treats. It will be sad to stop seeing them! And these treats are such fun. My son would love them. Anything gooey and I’m in! These look terrific — and so festive. Thanks. And Happy Holidays! I love Rice Krispie treats—but throw in chocolate and gooey and I’m a goner!!! I just banged my forehead off my computer screen trying to get a better look. Freaking amazing. I’m a sucker for krispies. You had me at gooey! These look incredible. Oh my goodness, those look insanely yummy! this looks genius and now I sort of what to rice krispie treat-ize a bunch of stuff!!! This is one of my favorite recipes and don’t be afraid to add shredded coconut, cranberries, and chopped nuts to your recipe. This is a blueprint, be creative! Great ideas, David! Sounds delicious.